If you think of your body as a clockwork machine, hormones are the fuel that helps each part function the way it is supposed to. With a pretty amazing variety of hormones secreting and circulating through our bodies, they keep functions like metabolism and reproduction going the right way. However, the slightest of imbalances in hormone secretion and circulation can throw your body off guard, and cause multiple complications, including ones that hamper your weight, fertility and coping with stress mechanisms. Matching steps with changing lifestyles, we must also update our diet regularly at each stage of our lives. And if you thought you could shrug off hormonal imbalances just because you are young, well you are wrong. A growing number of young adults, especially students, often have to resort to taking assignment help online due to illnesses mostly contracted as a result of hormonal imbalances. This post thus talks about the 12 foods that can help restore your hormonal balance, leading you towards a healthier and happier lifestyle. Around 50 hormones constitute our entire bodies, but a few are more important than others. The essential hormones control important functions like reproduction, weight, and stress factors for our bodies. Read on to know the three primary types of hormones and the foods that can help bring about a balance in them. Responsible for energy and metabolism functions, thyroid hormones include calcitonin, T3, and T4. The pituitary gland secretes TSH that regulates thyroid levels in the body. Sometimes, an inability to create thyroid hormones, iodine deficiency and autoimmunity issues may hamper thyroid production, and attack thyroid tissue. Here are 4 wonder foods that help keep thyroid levels in check. Ever wondered why the people from the Far East have lesser hormonal imbalance-related health issues? It is because they have a steady flow of seaweed or sea vegetables in their diet. Eating seaweed like wakame, dulse, nori, kombu and hijiki will help you load up on iodine, which helps in creating thyroid hormones in our body. Time for a visit to that sushi place round the corner, eh? Spinach has tonnes of iron. It enhances the thyroid functions of the body, and helps in producing thyroid hormones. With a fair share of vitamin B content, spinach can also be a ready cure for fatigue and sluggishness. Take a cue from Popeye, the sailor-man, and load up on your daily spinach intake! Loaded with selenium, two brazil nuts a day can keep thyroid issues at bay! Selenium, an antioxidant, works to protect the thyroid gland and convert T4 into T3, the active thyroid hormone. What’s more, they taste awesome as well! Almost all celebrity diets contain quinoa, and rightly so. An excellent source of minerals, protein and fibre, quinoa helps in keeping up the pace in your bowels. It is also a fabulous source of zinc, a mineral that helps in manufacturing thyroid hormones. Bookmark those quinoa recipes today! Reproductive hormones like oestrogen, progesterone and testosterone regulate our reproduction, libido, and organ growth. Apart from puberty or menopause, poor diet or lifestyle choices and exposure to toxins can often create an imbalance in our reproductive hormones. Here are 4 foods that can help regulate that. “Any great nutritionist would swear by their miso bowls”, says Norah Hopkins, senior subject matter expert. A mother of two, she suffered from hormonal imbalances that led to reproductive complications, and now she’s all about organic tempeh. Recounting her experience, she says that beta-glucuronidase enzymes in miso and tempeh help to combat oestrogen-related cancers and are rich in probiotics, which are essential in balancing the oestrogen hormone. Flax seeds contain antioxidants. Hence, it should be a part of any healthy diet. However, for people with a hormonal imbalance, it can be the magic food that cures it all. Flax seeds are a superb source of phytoestrogens that help in the excretion of excess oestrogen from our bodies. Flax seeds are great in combating other hormone-related issues like breast cancer, osteoporosis, and menopausal symptoms as well. Quick tip: do not refrigerate flax seeds, or they lose their antioxidant properties! Broccolis are rich in glucosinolates, a type of sulphur compound that eliminates and neutralises carcinogens. Additionally, broccoli also has isothiocyanates and indole-3-carbinol (I3C) that are great for preventing oestrogen-related cancers. To top it all off, broccolis are high in fibre, which helps eliminate excess reproductive hormones through regular bowel movements. Loaded in vitamin D, salmons help manufacture our reproductive hormones. They also increase testosterone levels, and power up bone health and immunity of our bodies. Salmon has plenty of omega-3 fatty acids, which are proven to reduce breast cancer and prostate cancer risks. So don’t hesitate to order that appetising salmon entree the next time you decide to dine out! Adrenal hormones like cortisol, adrenaline, aldosterone and DHEA help us manage stress. Insomnia, poor diet choices and prolonged exposure to emotional and physical stress lead to adrenal hormone imbalances. The following 4 foods can bring adrenal hormones back on track. One of the most versatile of foods, eggs are awesome in so many ways! Choline vitamins from eggs help our bodies manufacture neurotransmitter acetylcholine which keeps the nervous system, memory and brain health in check. The anti-inflammatory omega-3 fatty acids from eggs protect and support the brain in its normal functions, keeping stress levels in check as well. Always remember to pick organic or farm-hatched ones to bring egg-scellent health your way! Kale gives you vitamin A, B and C. This dark and leafy vegetable works wonders for keeping up your adrenaline levels. That, in turn, keeps nervous systems running smoothly. This antioxidant-enriched veggie is a great weapon against stress, bringing down the damage levels remarkably. If you think kale smoothies are taking it too far, try pasta or salad recipes with the same! Vitamin C is essential for the functions of the adrenal glands. Bell peppers have tonnes of them! Our adrenals usually store up on vitamin C reserves and stress makes us use most of it. Bell peppers replenish vitamin C levels for our adrenal glands. Bell peppers also have loads of vitamin B to offer that energises us, and keep a check on our stress levels. The best thing is, bell peppers go with any diet, and taste yum too! Adrenal hormones are prone to recurring issues due to fluctuating blood sugar levels, and too much sweet intake hinders the functions of the adrenal glands. Avocados help combat the rising blood sugar levels. They are loaded with healthy fats that support our nervous systems. Top that with a healthy dose of vitamin B5 to handle stress like a pro, and you have got a winner among the veggies, right here! Indulge in that guac platter all you like, for avocados are friends for your adrenal hormones. One look at cooking channels on YouTube will tell you that eating healthy can have a super-tasty twist too! 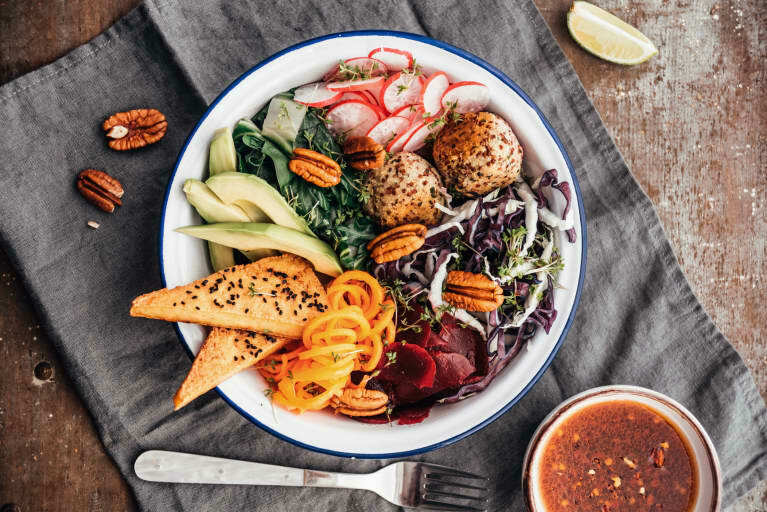 From quinoa piecrusts to energising kale smoothies, there’s a lot you can do with the healthy, hormone-balancing foods listed above. Include the 12 foods in your diet, and you will never have to worry about hormonal imbalance, ever again! Here’s wishing you a happier and healthier life ahead! Gracie Anderson, an Adelaide-based nutritionist, offers swift assignment expert for students through EssayAssignmenthelp. A part-time blogger by choice, she enjoys writing about healthy eating habits that can help people inch closer towards their goals of physical and mental well-being.